Come to 6204 North Radcliffe Street, Bristol and you'll see the wonderful life living on the Delaware River provides. 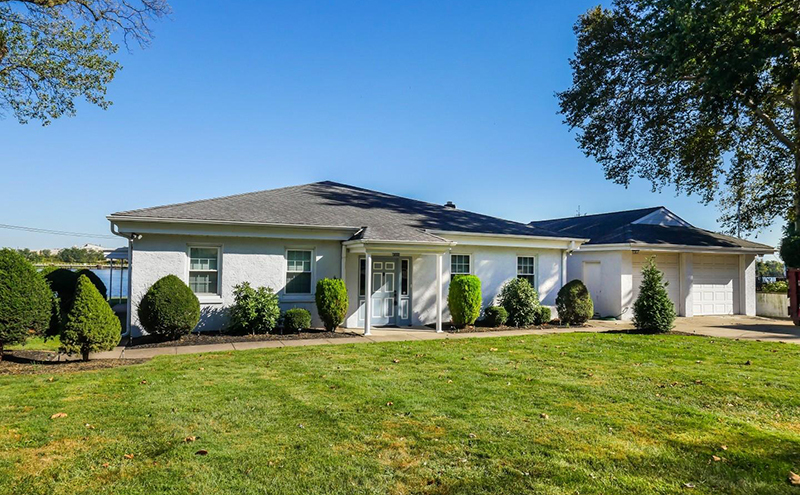 This brick ranch‑style home in the Edgely Section of Bristol Township boasts over 3,300 square feet with a potential in-law suite. There are stunning views with the peace of mind of a secure retaining wall. There is also quick access to the turnpike and bridge for commuters. From the covered side entry you have a tiled foyer that opens to a bright and airy living room featuring a bank of windows that brings in the river views and has a brick fireplace that is encased in extensive architectural trim with display shelving. The spacious dining room offers a picture window framing the view, a chair rail and a country style split door that leads to the sunroom. A relaxed ambiance fills the Florida room that gives you a great space to rise with the sun or enjoy a night cap as the stars fill the open sky. The kitchen is enriched with beautiful raised panel cabinetry, contrasting wood floor and a spacious area for a dinette. A secondary bedroom is lined with the richness of paneling and features a double window. Passing two cedar closets we come to the master bedroom featuring great views, a double closet and direct access to the Florida room through the Dutch door. The third bedroom is nicely sized, has a sunny disposition and double closet. With natural light the cheery full bath features lots of cabinet space, a jetted tub and step in shower. The laundry room is bright and has access from the main residence and the in-law suite. Incredibly spacious, a family room creates a warm appeal with exposed beams, built-ins, a bar area and makes a great entertaining area. Passing the front foyer that brings you in from the driveway you also have an office with exposed beams and built-ins. Entering the potential in-law suite you have a living room and a sun-filled eat-in kitchen with lighted ceiling fan. The full bath is tiled and has natural light, while the sizable bedroom with ample closet space completes this floor plan. Outside you have a level yard with two patio areas for seating to enjoy the spectacular one hundred and eighty degree views of the Delaware River. This scene will take your breath away on a daily basis. 267‑759‑9518 to schedule a private showing—come see all the potential 6204 North Radcliffe offers. For more details and photos see Radcliffe Street at Bristol Township Homes For Sale. Call the John McClintock Team at 267‑759‑9518 for no obligation recommendations on pricing, staging and marketing your home for sale.